Thyssenkrupp Elevator brings together the thyssenkrupp group’s global passenger transportation systems. The company has built its position as one of the world’s leading elevator companies from scratch in a mere 40 years’ time, by applying thyssenkrupp’s unique engineering capabilities. Offering smart and innovative products and services designed to meet customer’s individual requirements; their portfolio includes passenger and freight elevators, escalators and moving walks, passenger boarding bridges, stair and platform lift s as well as tailored service solutions for all products. Over 1,000 locations around the world provide an extensive sales and service network to guarantee closeness to their customers. Thyssenkrupp is a diversified industrial group with a growing share of capital goods and service businesses and traditional strengths in materials. When the original component manufacturer (ocm) communicated the EOL notice for the P80C592, Rochester Electronics became thyssenkrupp’s key ally for a resolution. With original design and test data transferred, Rochester Electronics successfully re-created the P80C592 for thyssenkrupp ensuring a seamless production, without any need to modify the software or hardware and thus avoiding costly redesigns and requalification rounds. The P80C592 is a single-chip 8-bit 8051 microcontroller with on-chip CAN controller, and it is used in several products at thyssenkrupp. 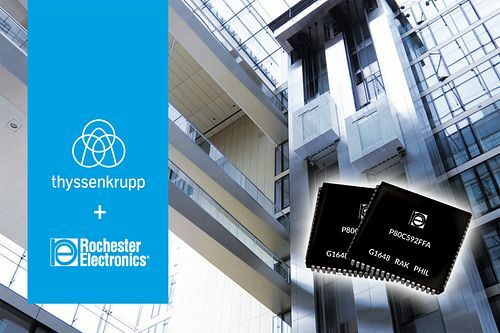 “Following the EOL announcement of the P80C592 microcontroller, thyssenkrupp Elevator engaged with Rochester Electronics to do a complete re-creation of this component. Working together, Rochester and thyssenkrupp were able to re-create, test and qualify this component within less than a year, from project start to mass production ramp-up.